Biking was a great way to see so many sites in one day! We had a great time on our bike tour through Paris. Our guide, Susana, was very knowledgeable and knew her way around town! We were able to see so much on our bikes ... much more efficient way to get around compared to walking or driving. I highly recommend booking this tour. Suzanne was the best tour guide you could ask for! She kept a good pace and was always aware of our safety while giving us an indepth history of Paris! Do not miss this opportunity to see the city through her eyes!! Great way to see Paris and get all the highlights! A delightful and informative 3.5 hour bike tour of Le Marais and St Germain. Susanne had listened carefully to our tour goals and designed a perfect afternoon. Seeing Paris by bike was a special experience - Highly Recommended! FANTASTIC..Susanne is a human GPS!! We bicycled all over Paris. Susanne was very in tune with what I wanted to see and how long I wanted to stay. She knows all of the revolutions (no small task)! I had a GREAT..GREAT time...Do yourself a big favor and tour Paris with Susanne. Susanne was wonderful in her willingness to tailor a bicycle tour to our group's needs and interest areas. She has a passion and she is great at sharing it. 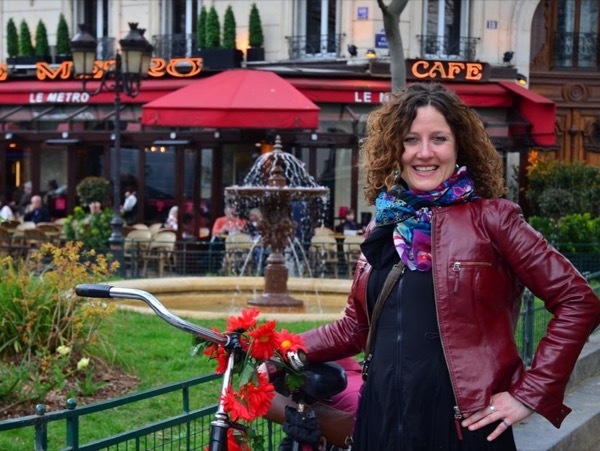 So, if you hadn't thought to cycle through the City of Light, let Susanne show you how much fun and how interesting it can be. Susanne was great. We hope she is still there when we visit the city in the future. My son and I had some much fun on our Biking Tour, it's one of the best ways to go around Paris. Susanne was absolutely wonderful. She was knowledgeable, patient, and a great tour guide. We learned so much about Paris and the city's history while having fun riding through Paris on the bikes. I will definitely book a tour with Susanne any time I return to Paris. TOUR GUIDE RESPONSE: Thanks Tara:) I also had a lot of fun with you and your son. You're great bike riders and open minded persons I love it! All the best! Susanne was everything we wanted in a guide: Extremely knowledgeable, highly organised, lovely personality, perceptive, cool, calm, and collected. And we just loved the way she rides a bike! We'll be back for more next year, Susanne! TOUR GUIDE RESPONSE: Oh thank you soo much! This means a lot to me such beautiful words! I had a fantastic time with you and your family, you're wonderful people and good bike riders:) It would be my pleasure to show you more of my bike friendly Paris next time! Au revoir! Bicycling was a great way to get a sense of the neighborhoods as well as see some of the traditional tourist highlights. Susanne was a great guide. She tailored our tour to accommodate my teenage son and my less adventuresome daughter. The tour was private and in my estimate beats both bus tours and private car tours. This was my children's first visit to Paris and I would recommend this tour and Suzanne for those who want to get a sense of Paris apart from their tour bus and hotel neighborhood. TOUR GUIDE RESPONSE: Thank you Deen! Beyond doubt that the bike tour beats the bus and car tours :) Have a safe trip home and say hi to Zoe and Patrick from me. Susanne was very friendly and knowledgable. She made the day a fun and interesting adventure and showed us parts of Paris that we never would have seen on our own. We would highly recommend her! TOUR GUIDE RESPONSE: Thank you Eleanor! I had a wonderful and fun day with you and your family too. Hope to meet you again! Say hi to everyone from me. Best wishes. Susanne was fantastique. we had a blast and the pace was leisurely, we stopped frequently for her little stories. She can adjust the pace to match the experience of the bicyclist. Never felt unsafe biking thru Paris. The morning was raining so she brought ponchos. We highly recommend her. TOUR GUIDE RESPONSE: Merci Nancy! Susanne was a wonderful guide! Very flexible, great knowledge and wonderful suggestions. She made my first day in Paris a delight. TOUR GUIDE RESPONSE: Merci beaucoup Peter! Have a wonderful trip! TOUR GUIDE RESPONSE: Thank you!!! It was great meeting you. Come back some time for more biking, in Versailles for example:) Say hi to your lovely family for me and have a great holiday. Cheers! What a fun way to see Paris. Suzanne was very accommodating and knew the city inside and out! Our family of 7 had a blast riding around the streets of Paris. This was definitely a highlight of our trip to France! TOUR GUIDE RESPONSE: Thank you for these words Jill! I hope to see you back to discover more of Paris and/or surroundings per bike! I wish you and your family all the best! We had a great 4 hour bicycle tour of Paris. We were shown the most important "must-sees". Also lots of other interesting sites you do not necessarily find in the guidebook. Cycling was a great way to see Paris compared to riding a guided tour bus or traveling by metro. The guide communicates well in fluent English and told us interesting stories of the buildings and other sites we passed on our way. We used the Velib system (Paris bike sharing program) several times after the tour in order to get around.